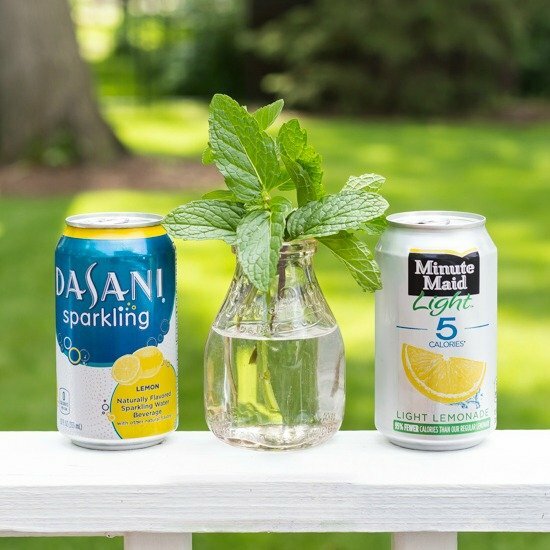 This mint lemonade spritzer recipe is a refreshing summer drink that mixes up in minutes and tastes amazing. Less than 5 calories per serving! Sometimes it’s the simple things in life that bring us the most satisfaction. Almost without exception, the recipes I share on this blog are easy and anyone can do them. 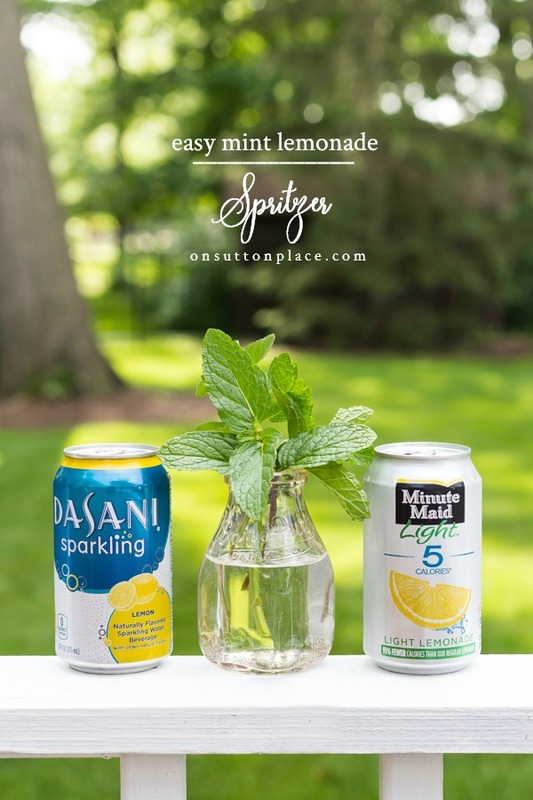 That’s the story with this mint lemonade spritzer recipe that I’m featuring today. It’s so easy…and I find myself looking forward to making it every day. It quenches your thirst and the taste of fresh mint is like no other. I happened upon this combination by accident. I picked up the lemonade at the grocery thinking it would be a nice change from water. One day, I combined the lemonade and sparkling water because I had opened a can of each and finished neither. 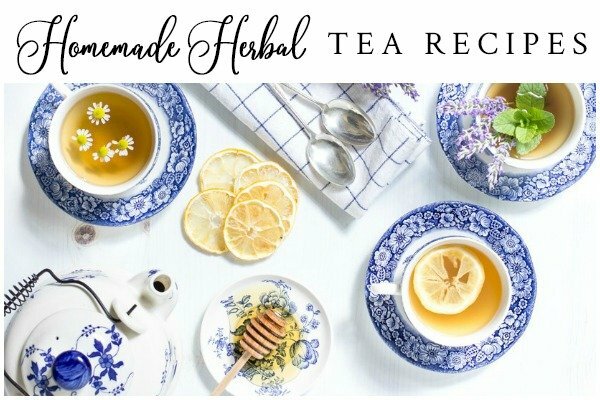 I was pleasantly surprised at how good it was…and the next day when I made it again, I added the mint. 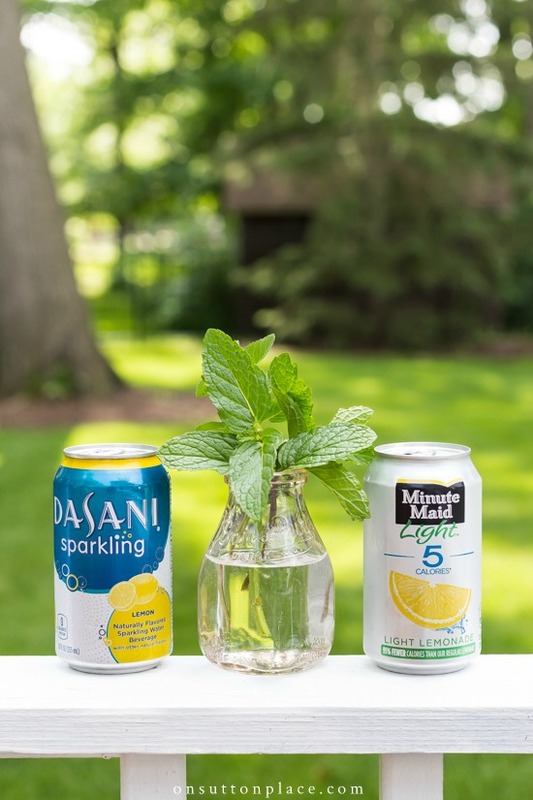 This mint lemonade is like a fresh summer spritzer and, in my opinion, the perfect summer drink! I make it by the glass, but it could definitely be made in a pitcher. A clear pitcher filled with this lemonade would be beautiful with lemon slices floating on the top. You can leave the mint leaves in the drink, or remove them. I usually leave them in the glass, but they have a tendency to clog things up if you use a straw! Place 3 mint leaves in two large glasses. Add ice and let sit for a few minutes. Pour equal amounts of the sparkling water and lemonade into each glass. Garnish with fresh mint and lemon slices. Makes two 12 oz. servings. I’ve been working hard at getting my yard and deck ready for summer. Truth be told, I’m a little tired, so I’m glad things are almost squared away. As much as I love this house, it’s a challenge at certain times of the year. I tell myself that God will let me know when it’s time to leave here. So far I think he wants me to stay, so I’ll keep plugging away…sooner or later everything always gets done. 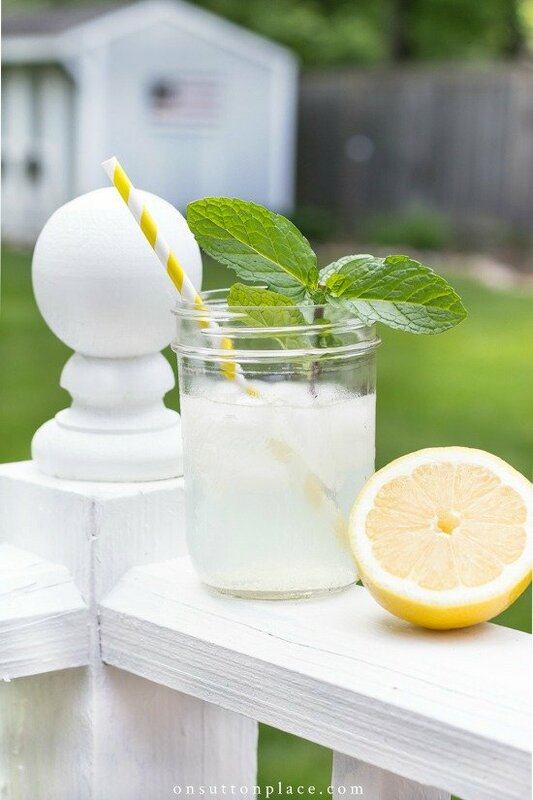 Hopefully, within the next week or so, I’ll be sitting on my porch sipping this delicious mint lemonade spritzer. I enjoy your blog so much. I always find fresh and new ideas! Thanks so much! Sounds Good an refreshing. Thank you for sharing. I ‘ll have to try it. Ann, I know what you mean about the yard work. I’m from Phoenix and we have one of the largest yards in the development. We weren’t terribly smart about the yard maintenance when we bought the house. Their is much trimming and then hauling away now that I am not working the yard is my responsibility. When it’s well over a 100 degrees I want to move. Though it does look good when I keep it up. Hang in there. I love your blog, I look forward to your posts. Oh gosh Jo I can totally relate. I agree it’s amazing when it’s all finished but during the process I want to run away from home! I could really go for some of this refreshing looking lemonade right now! We have jumped right into summer here with temps in the 90s. I love sparkling water but I’ve never noticed it in a can. Will look for it this week so that I can make this! Looks and sounds delicious! I will definitely try this mint lemonade. You are way too young to leave this beautiful home!!! Carla you could not have said anything more perfect. Thank you! That does sound refreshing! I actually had some homemade lemonade with a splash of vodka at a restaurant and the added basil leaves and it was delicious! I planted a little mint in my washtub, so maybe if things warm up, we can have some mint lemonade by the end of June. I will think of you on your porch as we have ours. It is the simple things that bring joy. Your printable is very sweet. Have a beautiful week. Brilliant Ann, I love it when things like this happen. You’ve created a new thing :) Maybe you should market it all made up into one can!! That drink does sound good:) I recently started making ice tea again because the coffee just hasn’t been hitting the spot when it’s hot. I’ll have to try this, thanks Ann!